I have always been fascinated by the first phase of architectural design. As an architect it is really exciting to talk to clients, create the first sketches and see how much ambitions you can put in it. But the process is also highly insecure - do the clients like it, can they finance it, does the construction company wants to build it and so on. It wouldn't be the first time a design ends up in the trash bin. I always found that the tools in which we create the early designs is failing to facilitate in this dynamic process of design experimentation, uncertainty, information gathering, visualization, testing and iteration. You sometimes have to wholly recreate a model when you get more restrictive building regulations or the client changes his mind. Although the architectural tools like BIM or parametric modelling are somewhat developing to address these problems I wanted to experiment with a different way of sketching that more closely fits the way you define buildings instead of just everything and do it in a way that always makes sense. I thought of a data-driven approach, where a sketch is just a minimal set of information that you need to define a architectural design, visualize, calculate and test it. 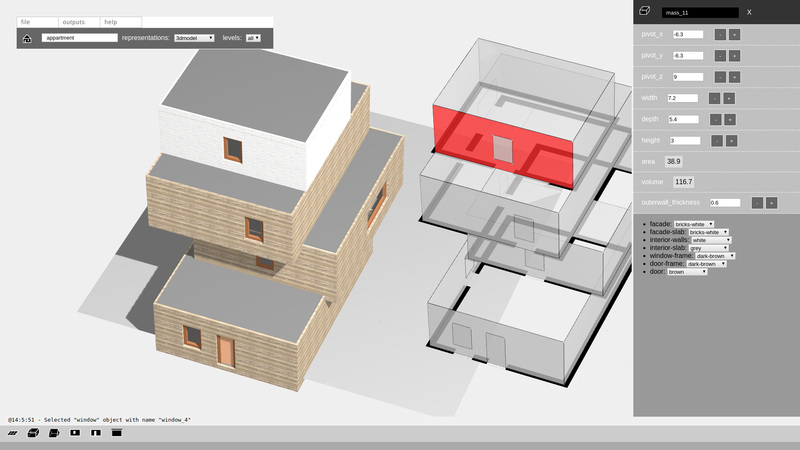 Below you see a first prototype of the drawing system which is online and is able to define simple buildings and represent it in the accustomed diagrams, floorplans, perspective drawings and so one. Being completely information-driven one can also easily calculate a variety of aspects in real time; construction costs for example. It all works out pretty well, but it is still very much in prototype phase. I do think it might one serve as a valid way of designing and supplying clients with a more transparent en fluid customer experience than they are used to now.